CRIME, GUNS, AND VIDEOTAPE: ALERT! Illinois Forbids Deadly Force To Stop Burglary or Home Invasions During Riots. ALERT! Illinois Forbids Deadly Force To Stop Burglary or Home Invasions During Riots. Chicago, IL--Because of the upcoming Grant Park Obama Election Day Insurrection I remembered a peculiar Illinois law that forbids anyone using deadly force on "looters" during disturbances and riots. This is a really crappy law that was hastily put together after the 1967 riots when the Liberal Illinois politicians were revolted by the number of young looters shot as burglars. It’s the called Looting law. Sec. 42 1. Looting by individuals. A person commits looting when he knowingly without authority of law or the owner enters any home or dwelling, or upon any premises of another, or enters any commercial, mercantile, business or industrial building, plant or establishment, in which normal security of property is not present by virtue of a hurricane, fire or vis major of any kind or by virtue of a riot, mob, or other human agency and obtains or exerts control over property of the owner. Of course police and citizens can always use deadly force to stop a deadly assault involving weapons or disparity of force. The same is true to stop typical crimes during riots such as sexual assault, kidnapping, arson, attempted murder, robbery either armed or strong armed. If you have to use deadly force remember four simple words, "I want a lawyer” Do not try and justify your actions by saying anything. Cops don't really have rights against self-incrimination like ordinary citizens. Don't ever surrender your rights! This looting law means is the police will stand by and watch the looters do their deeds. 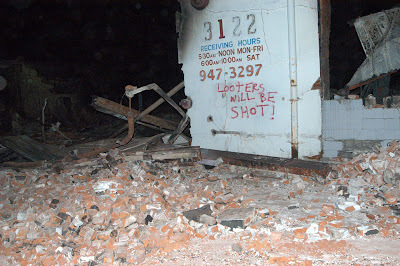 How do we determine that they are only looting when a door gets kicked in? Is there an ordinance that states they must wear t-shirts with "Don't use deadly force, I'm only looting" printed on it ? I can see liberal prosecutors giving hoodrats immunity for looting crimes in order to get them to testify against the owner of a home or business that threatened or used deadly force during a riot. I'm not so sure that a home invasion would apply under that statute. Either way, if someone breaks down my door while I'm home, they are leaving in a body bag.